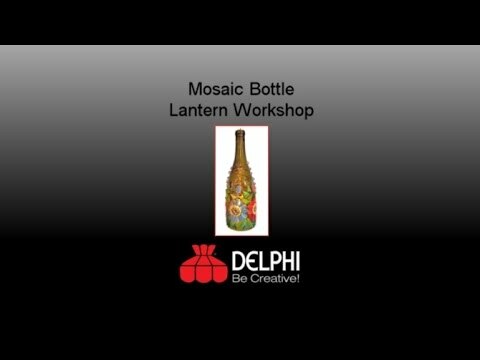 Class Description: Learn how to create a mosaic lantern using a recycled wine bottle with Julie Haan. In this 4½ hour class instruction will include techniques in bottle cutting, finishing sharp edges, use of mosaic tools, and application. All mosaic materials will be included along with patterns. Students will need to supply their own bottle to mosaic on. A Kinkajou Bottle Cutter Kit, a $54.95 value, is also included. No previous mosaic or bottle cutting experience is necessary. Safety: Please do not wear sandals if handling glass Safety glasses should be worn when handling and cutting glass. Tools & Materials Included: Mosaic materials (glass pieces, glass globs, glass tile) and glue for project are included. Additional Tools & Materials: Students should bring 3 to 4 standard wine bottles that are clean with the labels removed.